The washing machines outside my building are a case in point. Various handwritten signs appear taped to them for periods of time and then eventually (well, sometimes eventually) come down. I long ago learned to recognize the word for broken / out of order, but often the finer details elude me. The problem of words that I can’t read can be exacerbated by a cramped handwriting that I can’t decode. Sometimes I just take my chances, putting my money in the machine to see what will happen. A couple weeks ago I had a problem with the machine outside my building which dispenses drinkable water at 1 baht per liter. Anyway, I put in a coin in and no water came out. I tried another: the machine ate that too, without giving anything in return. There was a small handwritten notice, but all I could make out was ระวัง — not a good sign. I concluded the machine must be broken. Luckily I had a stockpile of bottled water in my apartment that had just been sitting around anyway — left over from the late 2011 floods! — and proceeded to use that. Days passed, and every once in awhile on my way in or out of the building I’d check the water machine, but the sign was still there. Finally, after about a week had gone by and my supply of bottled water run low, I decided to run a 1 baht test. Success, 1 liter’s worth of water dispensed! I resumed using the machine. There was a “10” written on the sign. So the machine was no longer accepting 10 baht coins? But hadn’t I used 5 baht coins on the day the machine had failed to work? 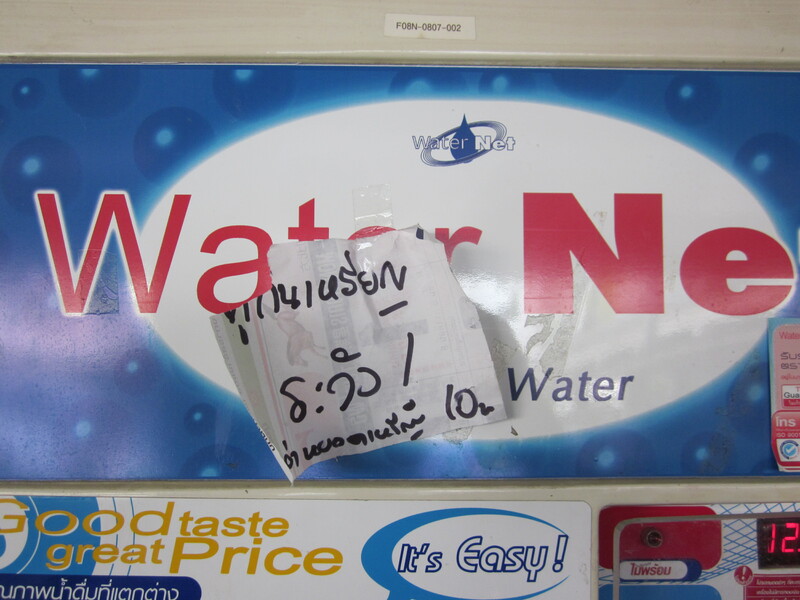 Anyway, I put in a 5 baht coin and…no water. I even did a vigorous “vending machine shake” but still, nothing. Then I tried a second 5 baht coin and…success! I ended up spending 11 baht to get my five 1.5 liter bottles refilled, and since then I’ve encountered a somewhat variable price structure as the machine takes an extra coin here or there. Oh well — still cheaper (and easier) than buying bottled water! That’s interesting! There’s a similarity between the wording of the Thai sign and the language I use in this post to describe the situation — despite my having been unable to read the sign: The Thai uses the word กิน, whereas I noted that the machine ate a coin without giving any water in return. Also interesting that the machine is called a ตู้.